February 13 – FIFA president Gianni Infantino made a surprise visit to Doha on Tuesday as Qatar marked National Sports Day. The FIFA president was seen alongside the Emir of Qatar Sheikh Tamim bin Hamad Al Thani, in a Qatar kit, at the Aspire Zone as they participated in a kick-about to mark National Sports Day, a public holiday in the Emirate. They were accompanied by senior officials of the Qatar Football Association and Aspire Zone Foundation. 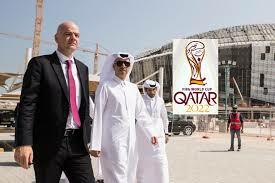 In December, Infantino last visited the Qatari capital as Doha welcomed a FIFA Executive Summit and the FIFA boss claimed that a “majority” of football federations supported increasing the number of teams playing at the 2022 World Cup in Qatar from 32 to 48. The increase would likely force Qatar to share the World Cup with its neighbours, but Infantino’s expansionist vision is complicated as the Saudi-led blockade against Qatar still rankles the Gulf and the UAE’s recently displayed antagonism towards Qatar at the Asian Cup last month hardly made for friendly relations at the level Qatar would be prepared to share the hosting glory of staging the world’s biggest sporting event. FIFA has said it will make its final decision in March after the completion of a feasibility study. Even as Infantino incessantly promotes his 48-team idea around the world, Qatar have always maintained that the 2022 World Cup hosts will have the final decision-making power over the number of participants in three years time. Qualifying for the 2022 finals will get underway later this year.